Joomla 3.6.2 – The most recent request was denied because it contained an invalid security token. When the Joomla 3.6.2 update finalizes I get the following message. The most recent request was denied because it contained an invalid security token. Please refresh the page and try again. I just delete out everything in the URL after “administrator” and hit refresh. I can’t wait till this gets fixed. Have to admit I am disappointed with this last round of Joomla updates. The next site I started the upgrade. I use Akeeba so it ran an Akeeba backup, and then gave me the error. When I cleared the the stuff in the URL after “/administrator/” the site said I still needed to update to 3.6.2. The site was telling me to update other components so I started with upgrading Akeeba from 5.1.3 to 5.1.4. After I updated Akeeba to 5.1.4 and tried the Joomla update the update installed correctly. Another Joomla! update just two days after the 3.6.1 update. It is getting stressful to stay on top of all these update and the pitfalls one can encounter. Here are some tips I have come across this morning. I have updated a few sites this morning and had no real issues. I did have to do the following to get everything to work. Go to Extension > Manage > Database. I had to upgrade my Akeeba to 5.1.4 on one site first before the update worked. This brings about the question of how much to charge customers to keep the site up-to-date. That will depend on how much you charge per hour and how complicated the site is to review to ensure the upgrade didn’t break anything. Here are some things I am putting into considerations. Time it takes to upgrade – ( 30 minutes ) I timed my 3.6.1 update to 3.6.2. It took about half a hour to update Akeeba, run the Joomla update, clear the cache and quickly check the site. How many Joomla Updates per year – ( 10 times per year ) I wasn’t able to find this out directly, but another site that did a comparison on CMS’s stated that every 31 days is Joomla’s update cycle, so roughly 10 updates per year. That brings us to about 5 hours per year in just updating the Joomla! core if nothing goes wrong. I had to move a WordPress site from a test server to my localhost. When I finished my changes I went to run an Akeeba backup, but got the error that the default directory wasn’t writable. I found this article that helped me. The solution was to go into Akeeba >> Configuration Page >> in the output directory field put in “[DEFAULT_OUTPUT]”. Well you can learn something new everyday. I was looking at a proposal that I thought Joomla would be a good fit for. The proposal asked about enforcing password complexity. I wasn’t sure that Joomla 3.6 did this natively, but it does. I found the following article that quickly demonstrates how to set it up. Here is how it looks in Joomla 3.6. 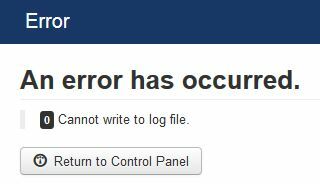 Joomla 3.6.1 update – An error has occurred – Cannot write to log file. I recently moved a site to a new Godaddy hosting account. I had to move the site manually instead of using Akeeba backup, so I had to make few changes to the configuration.php file. When I got the 3.6.1 available update in the control panel I test my localhost version and everything worked perfectly, so I decided to do it on the live site. I got the following error when I went to install the update. A Google search lead me to incorrect path to the log directory in my configuration.php file. Here is what mine looked like. I logged into the Godaddy hosting CPanel and found the “Home Directory” path. I added that to the configuration.php file and used FTP to upload the file. Cleared the site cache and ran the update again and it worked. I had tried just using Filezilla to change the folder permissions, but that didn’t do it. When I would go into the administrative area of the site and go to System >> System Information >> Folder Permission the log directory was still unwritable. Good video on setting up emails in Woo Commerce. Here is a good article on setting up Paypal Sandbox. I wanted vcards or .vcf files to uploaded and downloaded from a joomla site so the customer could update them themselves. I had K2 installed on the site and it was easy for me to download the .vcf file, but uploading was unsupported. JCE was installed and I discovered that JCE “File Manager” add-on has an allowable file extensions built in. It was easy for me to add the extension. Then I used “JCE File Browser” to upload the files. Here is the article that helped me out. I am using K2 component on a Joomla site and find it very useful. I was setting up Front-End adding and editing of K2 blog items. Here is a great video for setting that up. 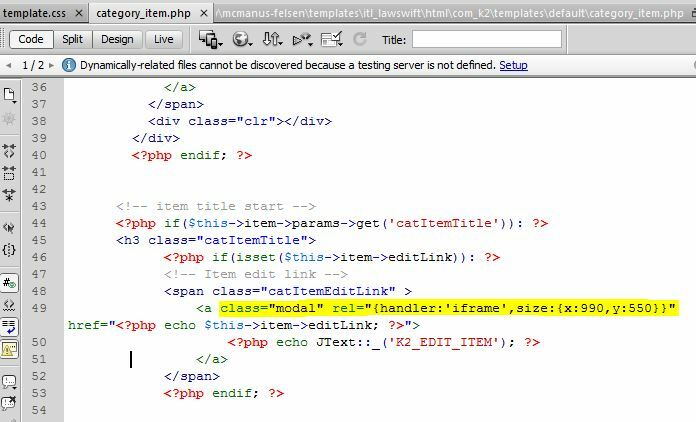 I ran into this issue with the template that has a “HTML” override for the K2/templates/default/category_item.php. The code looks like this. The issue was the templates “Modal”. I removed the highlighted class and rel tag, and added “_blank”. Now the “Edit item” button was showing and I could click it and edit the post. It of course opened in a new window. I looked at the code from the original K2 component/templates/default/category_item.php file. It has “data-k2-modal=”edit”” to open in a modal. I added this line and I was close enough. One issue remained where the “close” button didn’t close the window; however, if I clicked outside the modal window it would close the modal window.